Nuts love seeds, seeds love dark chocolate, and they’re all in love with coconut. Be prepared for a big bear hug of flavor, when you combine all those flavors into healthy and low-carb granola bars! Instructions are for 20 servings. Please modify as needed. Mix all the ingredients in a blender or food processor until they are coarsely chopped. Spoon the mixture into a 7x11 baking dish, preferably lined with parchment paper. Bake for 15–20 minutes, or until the cake has turned golden brown. Let cool a little and remove from the baking dish. Divide into 20 or 24 pieces with a sharp knife. Melt the chocolate in a water bath using a double boiler or in the micro-wave oven. Dip each bar in the chocolate, but just about half an inch or on just one side. Let cool completely. Keep in the refrigerator or freezer. Just use your favorite nuts and seeds, or what you have on hand. 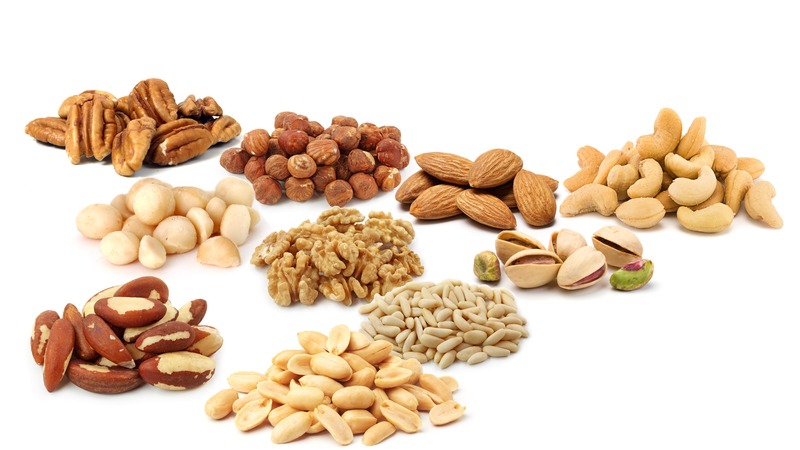 A healthy nut and seed mix could consist of equal parts of almonds/hazel nuts/macadamia nuts, pecan nuts/walnuts, sunflower seeds, pumpkin seeds, sesame seeds and flax seeds. The tahini (sesame paste) can be substituted with almond or nut butter. But remember that for example peanut butter has a lot more carbohydrates than sesame paste. Let your imagination run wild! I love these. They are kind of crumbly but really good. I use them also as granola in my yoghurt, delicious!! These are a keeper, just have to get them firmer so I can take them with me to work without crumbling apart. I made these and they came out very nice delicious.My husband and 15 months old son likes them. Will definitely be making them as out snacks on day out. As another poster said, I found these very crumbly - so much so they didnt hold together at all once cooked. That having been said, the resulting crumb was delicious mixed with a dollop of extra thick double cream! As Lin says, these are delicious, but the second time I made them I found that the mixture didn't hang together well. Could there be too much coconut oil in the recipe? My sister also made them and, following the recipe, there were pools of coconut oil on the finished bake, which had to be mopped up! So, should it be 6 teaspoons rather than 6 tablespoons? Just wondering. Just made these tonight and agree with above comments. Delicious but fell apart. Love to find out a way to make them hold together. Are the carbs listed in nutrition total carbs or net carbs? Try more egg or egg white? Also, grind the dry ing finer. I added a tablespoon of coconut nectar. It adds about half a gram per bar of sugar (or one gram if you cut these into regular granola bar sized bars. So for a small bar it's about 4 grams carbs with one gram being sugar, but I think it helped them stay together better and added just a hint more sweetness (when you're low carb you don't need much, because the natural sweetness of foods stands out more). also, like another reviewer said, oil pooled on top after baking, but after they sat to cool it soaked back in, so don't dab it off!! That's your healthy fat- you want that to stay in them! I tipped the pan around to let it redistribute evenly. Very tasty recipe- Thanks! I did 6 teaspoons of coconut oil. 6 tablespoons seemed like a typo. I added a teaspoon of stevia and used flax meal instead because I forgot to buy flax seeds. I didn't have any issues with crumbliness. The flax meal probably helped with that. I will make this again with some more tweaks. Excellent base recipe for these kinds of bars. I found the first results very crumbly. Here's what I did and the results on the 2nd and 3rd time have been great. I cool them from the oven for 20 mins and then in the fridge for an hour. The coconut sets and the whole 'cake' goes nice and solid. Afterwards the cake can be cut into the bars really easily.....there is no crumbling. I store them in the fridge and they remain really solid. Anyone know how to get the total nutritional chart on these or any of the other recipes? I take a few of them with me to work, the trick is to keep them in the fridge untill you want to eat them. They won't crumble I promise ? But made them into granola instead with a sugar free chocolate sauce and is great. I made these for the first time. I followed Mike's recommendations (one less Tbsp of coconut oil,etc). Was perfect. Store in frig as well. I googled carbs in sesame paste vs peanut butter and the brand I have is equal in carbs so didn't go out and buy the sesame paste. Used the peanut butter. Really like them and what a bonus....low carb! Made these twice. First time yes there was a large pool of oil and they didn't turn out. Second time I reduced coconut oil to 4T and added an egg. I also added a layer of Lily's chocolate chip on the top. Came out awesome! Wow!!!! These are DELICIOUS!!! I made half the recipe (therefore 3T coconut oil) and used 2T coconut oil. I didn’t have enough pumpkin seed and used some sunflower seeds instead. Didn’t have tahini and used macadamia nut butter. There was a pool of oil when I removed from oven, which had me worried, but it soaked back in as it cooled. I got 12 bars from the half recipe, and I divided them in half again (cookie size). They’re not crumbly at all, but perfect texture and oh-so-delicious!!!! A new favourite! Has anyone calculated nutrition on this recipe? Just curious and tried it with online tool. Got 142 calories and 5gms carbs each for 24 servings. Not sure what I did wrong but there was a huge amount of oil on the top when baked? I made these and followed the recipe but added some cocoa powder and 100% dark unsweetened chocolate chips and they turned out great. There was a pool of oil on top when I took it out of the oven but I let the pan sit about 5 mins and it soaked in. They weren't crumbly and cut well. Delicious! I followed the recipe except that I used melted butter instead of coconut oil. And instead of dipping the bars in chocolate, I just spread it on top of the entire “cake” and let it cool and harden in the fridge before cutting into bars. And yes, it came out the oven with the butter frothing on top but as it sat to cool, it soaked back in, resulting in a moist base, instead of the crumbling others experienced. I only cut to bars once fridge cold and they didn’t crumble at all. Just made a version of these (I had no coconut or sesame seeds so I swapped them out for pecans and coconut flour). Worked a treat! I could have handled a bit more salt in them but the crunch and sweetness levels with 85% chocolate instead of 70% was just perfect for my tastebuds. They did threaten to crumble quite badly before they completely cooled, but as said above, the oil does soak back in nicely. A definite keeper of a recipe not least because it is so simple and I truly cannot bake! I found these to be a little bland so I added some chopped dates (just a few!) and pressed them into the top before they baked and it made such a difference. Very crumbly. Maybe next time I’ll add some psyllium & chia as well to help bind it. And some erythritol for more sweetness. And definitely grind the seeds & nuts before adding the rest! These are so good! It's October so I pumpkin spiced it up. :) I added used pumpkin spice instead of just cinnamon. :):) This is a keeper and one that I can play with for flavors. Thanks!!! I have these in the oven right now and wish I had seen the comments about adding erythritol and reducing the coconut oil before I made them. Really hoping they turn out well. My fourth batch is currently cooling in the fridge. Each version has been different; this one was 6 oz Pecan and 3 oz Macadamia. Pumpkin seeds replaced by Mixed Seeds. Chia replaced Flax. I added 2 oz dried fruit (chopped) which adds 1.8 grams of carbs per bar (I made 20 bars) but that's okay if you're counting. My food processor is small so I grind in batches. I make a very fine powder, a rougher grind, and finally a halfway chop; this helps consistency. After baking I let cool for 20 mins then cut out the final bar shapes. But before removing I drizzle the chocolate on top: snap 85% dark chocolate into small bits and microwave on Medium power for 60 seconds at a time; soon you'll have it liquid enough you can stir the lumps out, then you drizzle onto the entire tray. Chill in the fridge for two hours then take the bars out of the tray and wrap them in cling film and put in the freezer. Does anyone knows how many grams is each bar?? How many grams each bar weighs? I do not have that information. The key is getting 20 servings. I came here to write the exact same thing. I couldn't get anything to chop up since it all stuck together immediately. Can someone change the recipe for the future amateur chefs? We'll see how they turn out in the end. Thank you for your feedback, I will pass it on to the recipe team.